The world’s first combined live robotic milking and feeding system demonstration at an exhibition will be staged at the Livestock Event, to be held at The NEC, Birmingham on 2 and 3 July. The new feature will complement a display of robotic equipment from the world’s leading milking machine manufacturers. The demonstration will comprise 40 loose housed cows milking though a Lely Astronaut A4 system, whilst the Lely Vector automatic feeding system will ensure they have continual access to a self-mixed ration in the feed passage. 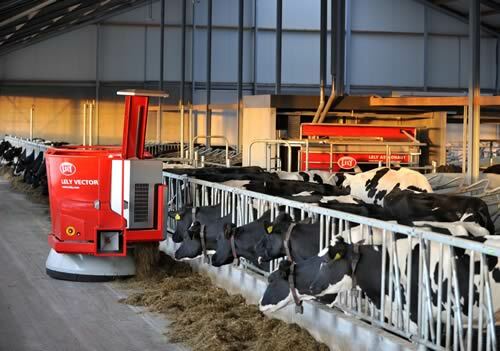 This live demonstration organised by Lely in Machinery Hall 16 will not only be of interest to dairy producers, but also to beef finishers seeking to improve livestock performance and farm efficiency, says RABDF Event’s chief executive, Nick Everington. Lely’s Tomás Cooney comments: “Our first live robotic demonstration at the Dairy Event in 2006 was an overwhelming success attracting over 5,000 visitors. Since then we have successfully demonstrated the Juno feed pusher in the live mixer wagon demonstrations, however automated feeding and milking of a herd at the Livestock Event will be a world first and we expect tremendous interest in this new technology.